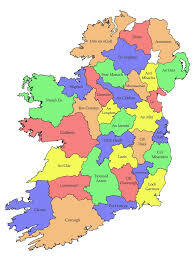 A weeklong schedule of events is being hosted by groups involved in Swift conservation here in Ireland. 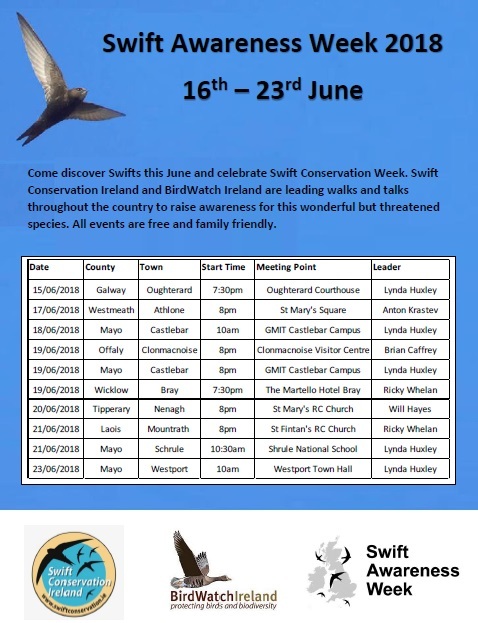 Swift Awareness Week will run from Friday June 15th to Saturday the 23rd June. 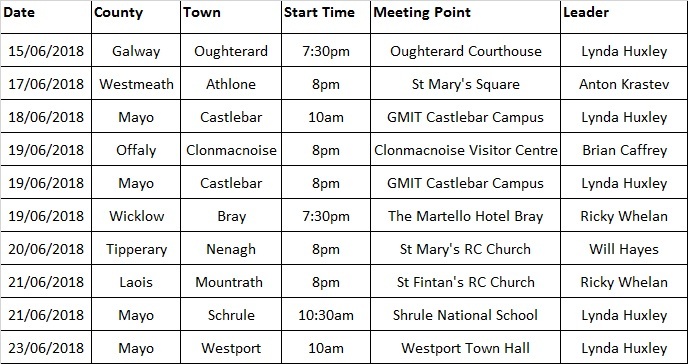 BirdWatch Ireland and Swift ConservationIreland have come together to host a myriad of events across the country, an initiative which mirrors events being organised by groups in the UK during the same period. 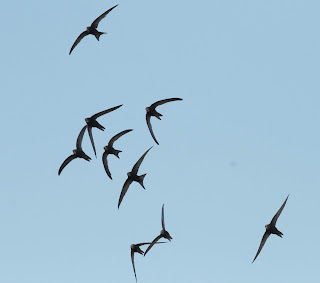 Swifts are a migratory bird that visit Ireland and northern Europe in the summer. They return to the same nest site each summer to nest and raise young. They migrate from southern Africa where they have spent the winter following the rains and feeding on the resulting profusions of insects. Swifts are a real sign of summer, arriving in Ireland in the first days of May and vanishing again by late-August. They are a bird highly adapted for life on the wing, they feed, sleep and even mate on the wing (the only group of birds known to do this). They spend the summer whizzing around our towns and cities feeding on winged insects and making their characteristic screaming calls as they go about their daily business. Swifts are often confused with Swallows and House Martins but are larger, lack the white on the underside of the body and do not build the mud nests we on gables and below the eaves of our homes. Swifts are amazing aerial acrobats and can be seen over most towns and cities during the summer months but in recent decades their numbers have declined significantly due to the loss of nest sites and the affects of climate change. Swifts have evolved to nest in old buildings, in holes in the eaves of houses, behind fascia boards gaining access to the top of walls and in gaps in stone-built walls. Modern buildings are designed and constructed differently than to those of the past and inadvertently exclude Swifts from nesting. Restoration work and home improvements can also lead to the unintentional loss of nest sites by blocking up entrance holes. 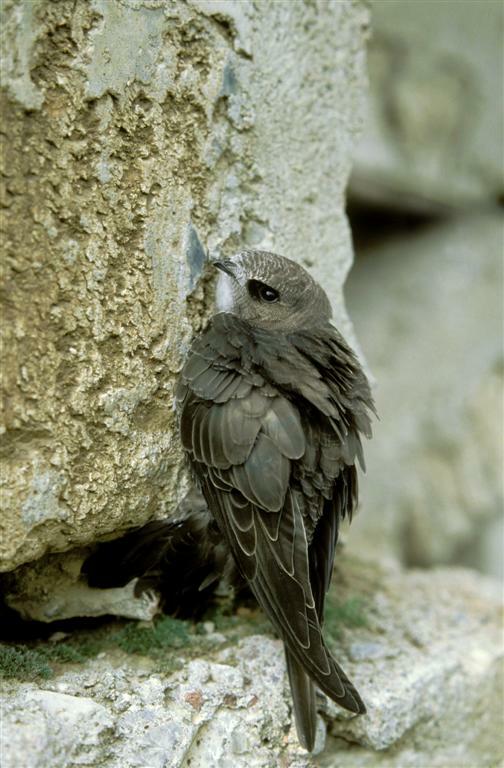 In Ireland there are numerous groups and individuals working to raise awareness for Swifts, implement conservation policy and oversee practical measures to help arrest the decline and help recover Swift breeding populations. 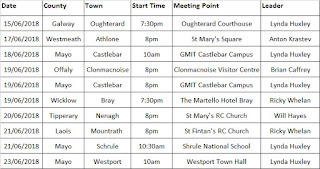 BirdWatch Ireland and Swift Conservation Ireland have combined efforts to host numerous events across the country during Swift Conservation Week which aim to get people out and about to observe these wonderful avian creatures and communicate the conservation pressure this species faces. All the events planned for Swift Conservation Week are free and family friendly.